The description is not prominent by default. However, some themes may show it. Yes, Throne supports category descriptions. Harry (bottom row, far left) and his colleagues in DFB. 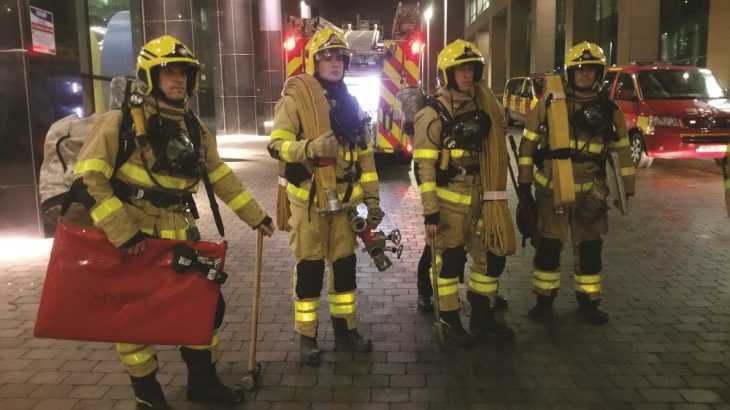 Conor Forrest caught up with Harry O’Keeffe, a former firefighter who spoke about his career with Dublin Fire Brigade, his role as a special service man, as well as his efforts to improve the workplace for his fellow firefighters. One hundred years ago, a small group of men and women marched out on the streets of Dublin, Enniscorthy and Meath to proclaim an independent Irish Republic. 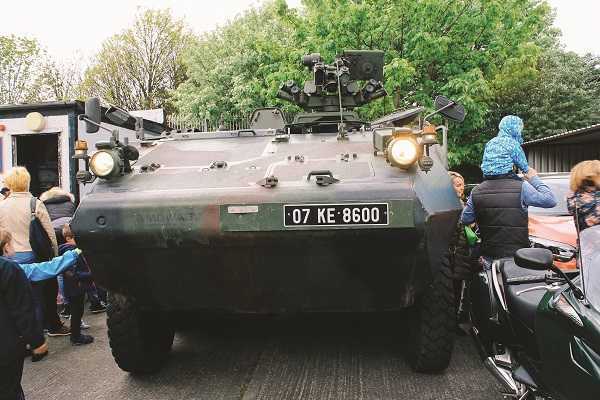 It was an event that would change the course of Irish history, though perhaps not exactly how Padraig Pearse and his comrades in arms would have imagined. 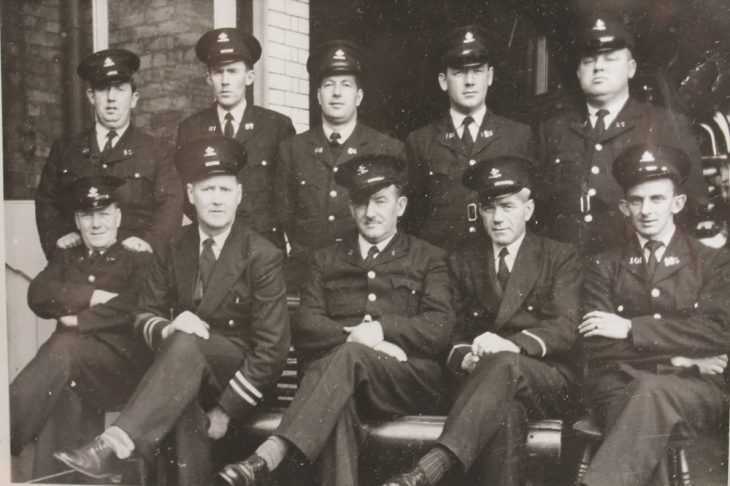 It was also the year in which Dublin Fire Brigade’s oldest firefighter was born, three days after rebel leader James Connolly was executed in Kilmainham – one Harry O’Keeffe. To say Harry has led an interesting life would be something of an understatement. Born in 22 Holles Street in May 1916, he grew up alongside the new State that had its origins among the ruins of Dublin that year. His childhood was a happy one, with a loving family, and among his earliest memories is attending the State funeral of Michael Collins, perched on his father’s shoulders at the age of six. In those days, jobs were scarce, but he managed to find employment in his early teens, first with Cantwell and Corcoran, which produced soft drinks, where he was interviewed by union leader Jim Larkin about the company’s employment policies. That was followed by a stint with the Grand Canal Company, and then the Calendars Overhead Cable Company – Harry cycled every day from Boyne Street to work in Drogheda, beginning at 4am and camping out during the week as the work moved further from home. Wicklow became a fond destination during his teenage years, particularly Kilmacanogue, and he often cycled there on his own or with friends to a cottage they had rented on the side of the Sugarloaf. Among the first group of girls invited to the cottage was one Teresa Maxwell, his future wife. Having trained as an electrical and mechanical engineer in his youth, this stood to Harry when an opportunity to join Dublin Fire Brigade arose, halting plans to move to Canada with Calendars. From many hundreds of applicants, only six were ultimately successful – including Harry. The manner in which he secured his job was perhaps an indication of the impact he was to have on DFB. “I was up in Castle Street, I went in before a few men, one of them was the young chief, Comerford. He was doing most of the speaking and he was summing me up,” Harry tells me. “When he was finished, I said ‘do I get the job?’ ‘Do you get the job? We’ll let you know in due time’.” This, however, was an unacceptable response in Harry’s mind. “Says I, ‘I’ve waited a long time to get this far, and I’d like to know where I stand.’ So he talked to the other men and said ‘Well O’Keeffe, you can take it you’ve got the job,” Harry recalls with a smile. He began his new career in 1938, under the command of Major Comerford, an ex-Irish soldier, and later under Captain Diskin following the untimely death of the former. “Him and I got on pretty well together,” Harry says of Major Comerford. Harry spent the majority of his DFB career in Tara Street as he was what was then known as a ‘special service man’ – because of his electrical knowledge, he was tasked with maintaining and servicing the old fire alarms on the street, which operated before the introduction of telephones. It was this role that prevented him from travelling to Belfast during the Blitz in 1941 – despite volunteering to travel – as he would have been difficult to replace should the worst happen. Among the many stories from Harry’s career with DFB, that of his role in the bombs that dropped on Dublin during World War II stands out, particularly those that fell on the Terenure area in South Dublin early in the morning of January 2nd 1941. That story was captured in The Bombing of Dublin’s North Strand: The Untold Story by Kevin C. Kearns, as explained by a colleague of Harry’s who joined DFB at the same time, Paddy Walsh. Workers’ rights were extremely important to Harry, and he expended great effort in agitating to improve the position of firefighters in Dublin, quickly developing a reputation as a force for change. When he first joined the fire brigade, firefighters brought food with them to work. However, noting that their counterparts in the UK and Northern Ireland had modern catering facilities where Dublin did not, Harry took the cause to City Hall, fighting long and hard for a mess to be provided for the stations. Harry’s tireless efforts on behalf of his colleagues and peers – which included reducing the retirement age for the city’s firefighters – didn’t cease when he left DFB in 1963 to join the Corporation Rents department, a job which provided a more stable life for Harry and his young family, along with an improved salary. His son Brendan recalls a story of Harry standing before a judge in the case of a tenant in arrears. Despite Harry working for the Corporation, he was pleading on behalf of the tenant, which perplexed the judge. 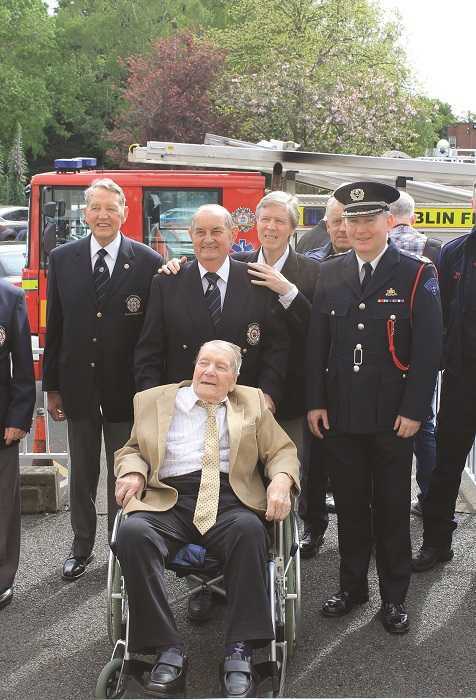 Looking back, it’s clear that Harry’s life was one of dedication – to his family, his colleagues in Dublin Fire Brigade, and to his lifelong principles. As with all of his tales of his fascinating experiences, Harry sums it up best himself. “It was quite a chequered life,” he says with a characteristic smile. He was also fascinated by space. In those days, meat would arrive wrapped in butcher’s paper, and Harry sketched out details of how a moon landing might happen. In July 1969, his visions were vindicated as Neil Armstrong became the first man to walk on the moon. Nobody knows if this drawing still exists, but included on the sheet was a list of DFB colleagues who had signed up for this once-in-a-lifetime opportunity. 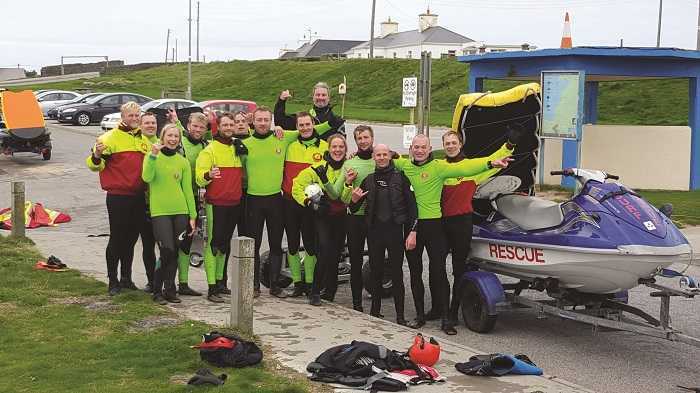 The Irish Tow Surf Rescue Club is saving lives in the water and on the beaches along Ireland’s west coast. We speak with co-founder Peter Conroy to discover more. Surfing isn’t just a sport for warm weather water, it’s a global passion. In fact, Ireland’s reputation as a surfing hotspot continues to grow, despite weather that is somewhat different to Australia or California – places like Lahinch, Bundoran and Tramore are all ports of call for surfers from Ireland and beyond. Though undoubtedly exhilarating, surfing can be also a dangerous sport. There’s a very real chance of drowning, of being overcome by waves that are stronger than they appear, of being caught in riptides or washing up on the rocks. However, if you get into difficulty on the west coast of Ireland, chances are you could be rescued by a Dublin Fire Brigade firefighter or one of his colleagues from the Irish Tow Surf Rescue Club. The club was co-founded by Peter Conroy, a firefighter based in No 3, who joined the brigade in 2004 after completing a Master’s in International Disasters Engineering & Management from Coventry University. Water was always in his blood, growing up as a competitive swimmer and discovering the world of surfing while lifeguarding on the beaches of Clare. During his down-time, Peter would take a board and hit the waves around the Cliffs of Moher, quickly becoming hooked on the sport. 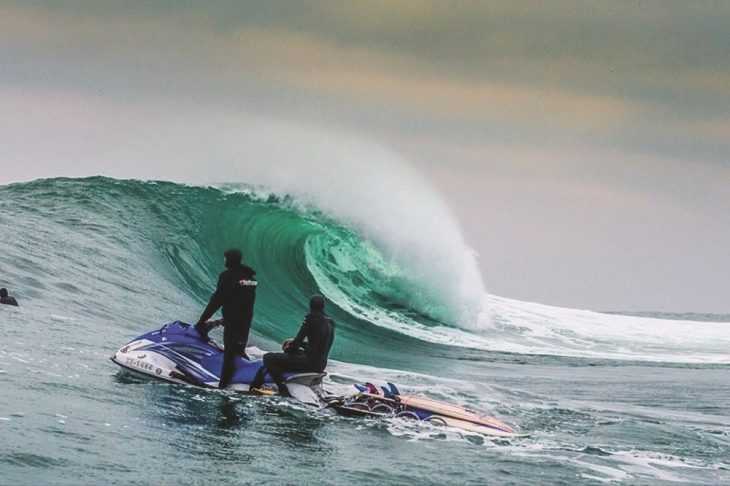 The Irish Tow Surf Rescue Club was born out of his love of surfing, founded in 2006 after Peter began tow-in surfing – surfers are towed into a breaking wave by a partner on a jet ski in order to catch higher and faster moving swells. Surfing one day beneath the Cliffs of Moher, Peter was trapped and was forced to swim through 20-foot waves to safety as the jet skis were unable to reach him. Relaxing in a pub afterwards, he and his friends realised that they should be able to rescue themselves, and others. A trainer from England was brought in to demonstrate the uses of the jet ski beyond its towing capabilities, and the group realised that the skis could be used for rescue purposes. From there the club’s reach began to expand, rescuing surfers in distress along the west coast and putting rescue boxes in place at the bottom of cliffs containing medical supplies, a VHF radio, survival suits and other useful items, ensuring that the team could access medical supplies in places unreachable by the skis. 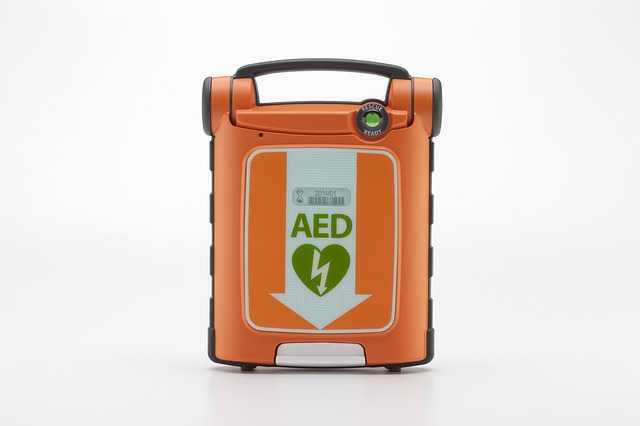 The group also began installing defibrillators in local hotels, which benefits both surfers or others in distress in the water or on the beaches, as well as the local community. They also coordinate with other voluntary emergency services like the Coast Guard, working where they cannot go or assisting rescues when required. Regular training exercises are carried out with the Coast Guard in Shannon, though the Club tries to involve the Coast Guard as little as possible, dealing with minor incidents on their own. Looking ahead, Peter hopes that the club will continue to grow, welcoming new members alongside vital financial support to fund their operations, equipment and training. The club is now certifying people in Rescue Jetski Operations, a three-day course on Friday evening, Saturday and Sundays that trains competent rescue jet ski operators and swimmers. For more information on the rescue club or how to join, search for Irish Tow Surf Rescue Club on Facebook. A team from Dublin Fire Brigade has been working hard on updating and developing the brigade’s high rise firefighting plan, coordinated by District Officer John Chubb. When you think of a city dominated by high rise buildings, Dublin doesn’t immediately spring to mind. New York, of course, and Tokyo. London perhaps, and Dubai. However the term high rise buildings, as B watch District Officer John Chubb explains, doesn’t solely refer to buildings that tower 50 or 60 stories above ground level, but rather those of five stories and above. “A more focused way to describe it is a building that the fire service has to depend on the provisions within for fire safety, whether active or passive, such as sprinkler systems, dry riser systems, smoke control and ventilation systems. Any structure that necessitates moving away from our fire appliances, which is our toolbox, and start depending on the builders’ and the engineers’ vision of fire safety, we would regard as a structure that requires firefighting tactics appropriate to high rise,” he says. Fires in high rise buildings require more complicated operational approaches than most structure fires. Tasks that are normally considered routine for most fire departments, such as locating and attacking the fire, evacuating occupants, and performing ventilation can become very difficult in high rises. As a result, Dublin Fire Brigade’s high rise emergency management plan is currently undergoing an extensive update by a team led by D/O Chubb. It’s by no means a new concept for the city – a plan was put in place for the towers in Ballymun back in the 1960s – but changes in Dublin’s built environment in recent years have necessitated a response. Updating and developing a high rise firefighting plan that takes into consideration the myriad challenges these buildings present is no easy task. Alongside changing scenarios once you travel 10 or 20 floors into the sky, DFB’s current fleet of aerial appliances can reach a maximum height of seven stories, which means that interior operations have to be conducted in buildings beyond that level, reducing the tactical options available to incident command. Though vehicles capable of scaling larger heights are available on the market, Dublin’s infrastructure has to be taken into account, in particular a warren of narrow streets that wider vehicles simply couldn’t pass through. 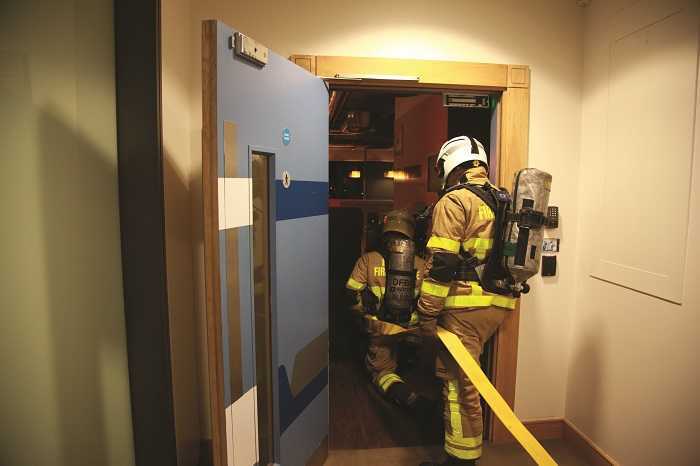 Elevators within these buildings are not always suitable for firefighters – special firefighting lifts are required that can overcome issues associated with smoke and water ingress. Multiple occupancies also pose a significant threat. In a smaller apartment block you might have four or five families, and evacuation can be carried out quickly and efficiently. In a high rise building that could combine offices with residential apartments, that number can quickly rise into the hundreds. There are other issues too. Reflex time (the time it takes from arrival on scene to getting water on the fire) can be increased greatly – a high rise situation necessitates moving equipment from the fire tender to higher floors, rather than simply running hose from an appliance across the street and into a normal two-storey house. Water pressure is another concern; when you try to move water to elevated levels you’re trying to overcome gravity and you lose the pressure required to operate the standard fog nozzle. 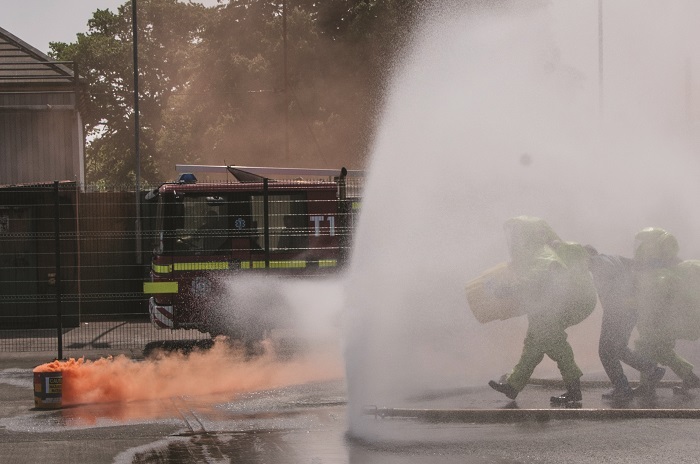 To counter that they’ve gone back to the smooth bore nozzles, which require less pressure to get water from A to B. The impact on personnel cannot be underestimated either. Before they add any equipment, the average firefighter will carry around 10kg of PPE, excluding a BA set. Add a hose, forcible entry equipment and accountability systems used to track personnel inside a fireground and you’re pushing 25kg, the limit recommended by the Health and Safety Authority (HSA). The brigade’s personnel are undoubtedly a hardy bunch, well trained and well drilled, but hefting 25kg up 20 stories in smoke and heat can get quite tiring very fast. The process of updating DFB’s high rise response plan began back in mid-2016 (though incremental modifications have always been put in place), scheduled to run for two years although D/O Chubb believes that it will be ready well in advance of the deadline. The project is multi-tiered and features multiple work streams, incorporating health and safety, fire prevention, EMS, operations and external partners. 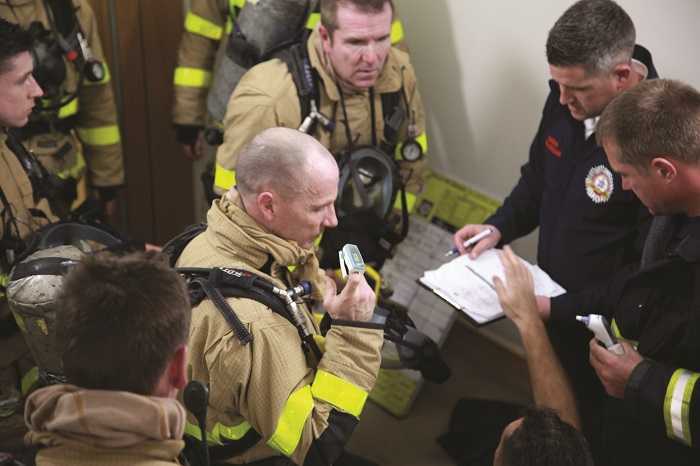 Insight from those within the brigade has proven vital – fire prevention officers have provided their in-depth knowledge in relation to building regulations, while the team has also utilised external engineering expertise. EMS staff have also provided insight into how EMS operations must be conducted within the high rise structure as opposed to exterior to a building on fire. The above challenges, and others, are the focus of this plan, and D/O Chubb and his team have looked to their colleagues beyond Ireland’s borders in search of best practice and innovation, considering and investigating a number of innovative devices already in use in brigades across the world. 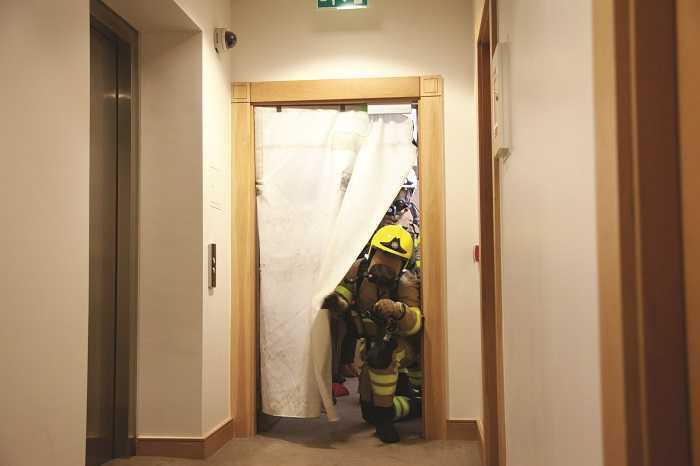 Take the smoke curtain, an ingeniously simple device that can be affixed over the doorway to a burning room, preventing smoke from filtering into the rooms or corridors beyond, aiding evacuation procedures and reducing smoke damage. Or the Fognail, which allows responders to fight fire from outside a room by penetrating the walls or doors using the tool and injecting a fine water mist inside. 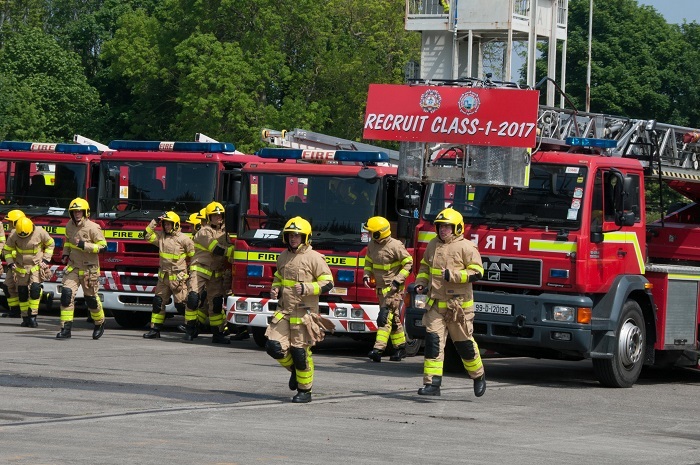 Once the plan has been completed, the next step will be disseminating its contents to all fire brigade personnel through comprehensive training and continuous professional development programmes. “A challenge that we have when we develop new practices or techniques is that we have to be sure that we disseminate that information in an even-handed way, and that the actual message is standardised. Essentially what we’re doing is we’re developing a curriculum. We have identified two key areas: the skills people need to have, and the knowledge they need to have,” says D/O Chubb. Practical skills include firefighting shaft operations, firefighting tactics, ventilation strategies, working with a building’s water supply, search operations, EMS operations, and command and control. The cognitive element is also important, and the curriculum will educate personnel on fire alarm systems, high rise building construction, firefighting lifts, fire behaviour, sprinkler systems and smoke control systems, providing a well-rounded knowledge base on which the brigade can build. This project is far from being a paper exercise in procedures and policies. D/O Chubb describes B watch HQ as the “fulcrum” of the project; testing the effectiveness of the strategies developed, discovering what does and doesn’t work, and pushing themselves to their limits, augmented by crews from Phibsborough, Donnybrook and North Strand. 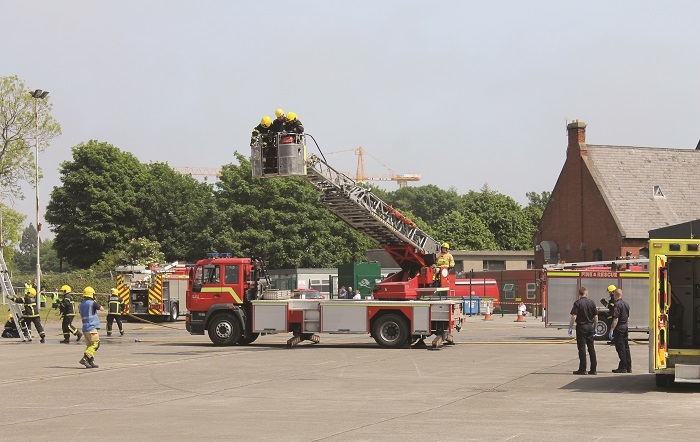 Two full-scale exercises have been carried out in high rise buildings across the city, and many more conducted in HQ, all of which will contribute to future learnings and the final plan. Class 1/2017 successfully completed their training programme at the end of May. 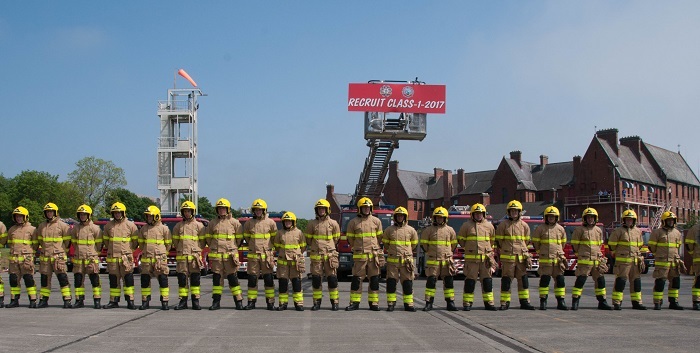 The recruits have completed a total of 29,120 hours of instruction from DFB instructors alongside training from Dublin Bus, An Garda Síochána, Renault and Luas, preparing them for the wide variety of incidents they are sure to encounter in the years ahead. Irish fire services, including Dublin Fire Brigade, have a proud tradition of serving communities across the country, well respected by the communities they serve. Going forward, the members of Class 1/2017 will have a duty to continue this tradition. 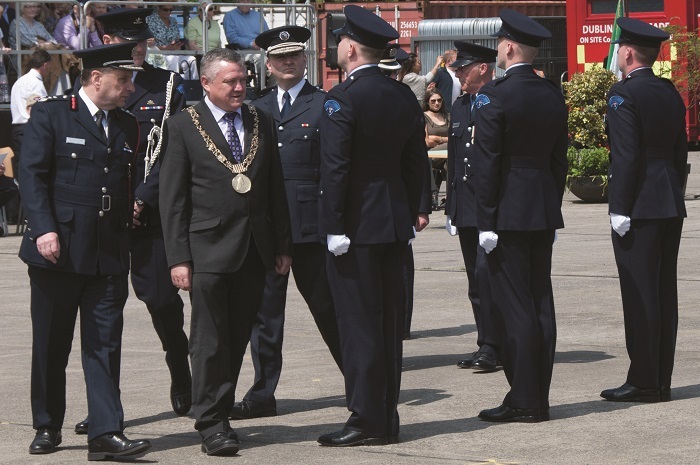 We spoke with Martin O’Reilly, EMS Support Officer, Dublin Fire Brigade, to discover more about the chain of survival in Dublin city and county, and how the fire-based EMS service model ensures the effectiveness of this chain. According to the HSE, surviving a cardiac arrest at any age is “directly related to time to resuscitation and particularly defibrillation”. These are two links in what is known as the ‘chain of survival’ for out of hospital cardiac arrest: early recognition, immediate and effective cardiopulmonary resuscitation, rapid defibrillation, pre-hospital advance life support, and postresuscitation care and aftercare. Take early and effective CPR, which can keep the brain and vital organs oxygenated, and can also buy time for effective defibrillation to take place – either by members of the public or the emergency services. Time is key, and CPR should commence as soon as possible following a cardiac arrest to provide the best chance for a positive outcome. “We know that after a patient suffers a cardiac arrest, if nothing is done then the patient’s chance of survival diminishes by between 7 and 10 per cent with every minute that passes. Providing bystander CPR gives the patient the best chance possible towards a successful outcome,” explains Martin O’Reilly, EMS Support Officer with Dublin Fire Brigade. The citizens of Dublin city and county benefit from DFB’s fire-based EMS service, in which firefighters are also trained paramedics. The system is in operation in a number of jurisdictions around the world, particularly in large urban centres, including fire departments across the USA, France and several in Germany, and plays an important role in ensuring a functioning chain of survival. As O’Reilly outlines, the fire-based EMS system in Dublin ensures the use of a structured approach when responding to cardiac arrests. The nearest fire appliance and ambulance are dispatched to a call, ensuring a sufficient number of paramedics to effectively manage a cardiac arrest. Alongside its clinical abilities, the fire appliance with paramedics onboard also facilitates a rapid response to immediately life-threatening calls – in 68 per cent of cardiac arrests the fire appliance will arrive in advance of the ambulance due to its strategic location and availability. 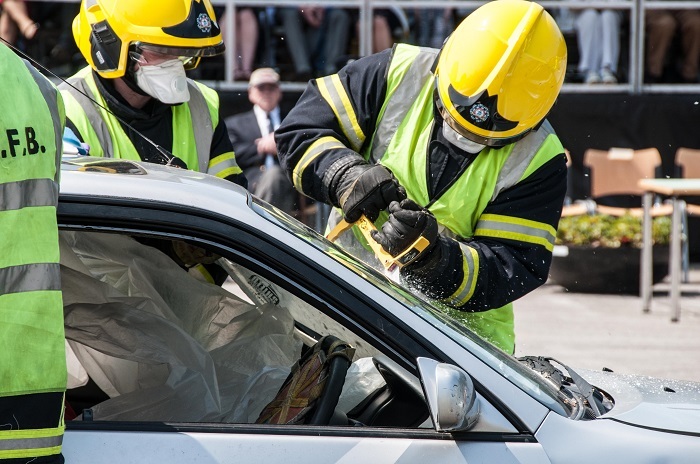 “Many 112/999 calls are of a medical and traumatic nature, involving single or multiple patients, and have a requirement for additional clinical resources and personnel to perform physical rescue, extrication etc. Firefighter/paramedics provide rescue/extrication skillsets as well as an additional response where needed. These additional resources also improve patient, bystander and practitioner safety on scene,” says O’Reilly. The combined firefighting and paramedic training all DFB recruits receive proves highly useful within situations that require medical and rescue response – one response vehicle can provide both skillsets. DFB personnel are educated and trained to perform multiple functions, including hazardous materials response, road traffic collision extrication, highline rescue, swiftwater rescue, and pre-hospital emergency care. 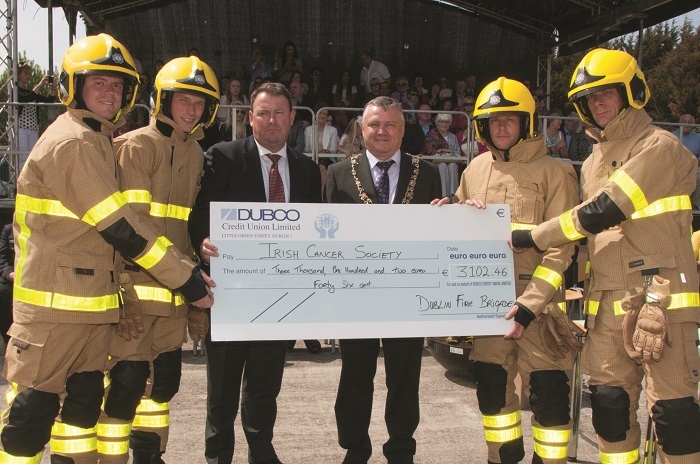 The ability of Dublin Fire Brigade’s fire-based EMS system to simultaneously dispatch fire and EMS resources is vital and saves precious minutes, particularly in life-threatening situations where every second counts, often making the difference between life and death in cases like cardiac arrests. This approach also reduces on scene time and helps get patients to hospital and definitive care much sooner – important links in a patient’s survival. 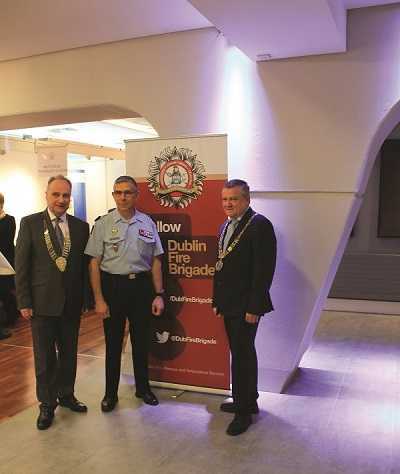 The annual Chief Fire Officers’ Association conference was held in Croke Park in 2017, organised by Dublin Fire Brigade. Conor Forrest was there on the day. 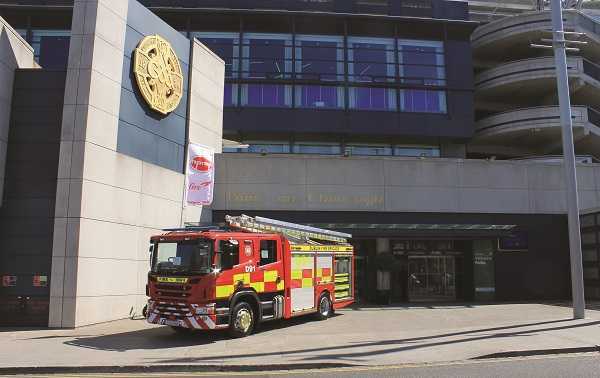 Last May, Croke Park was the location for the Chief Fire Officers’ Association (CFOA) annual conference, an interesting and varied two-day event organised by Dublin Fire Brigade and which tackled the topic of expecting the unexpected. 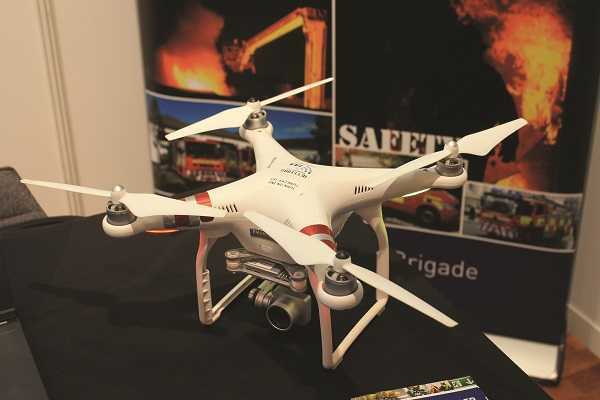 Drawing from fire services far and near, the comprehensive CFOA 2017 conference featured speakers on a broad range of topics from fire safety to media management. Washington DC Fire and EMS Chief Gregory Dean reflected on the systems in use in Seattle and Washington DC; Dublin City Council Senior Systems Officer John Lynch explained how business intelligence can be put to good use in the fire service; and Peter Holland, Chief Fire and Rescue advisor at the Home Officer provided an overview of the local and national structure of the UK’s fire services. An opportunity to listen and learn from colleagues, not just in Ireland but around the world, and to discover best practice and innovation for the years ahead, the conference also looked to the future of fire services, with topics such as innovation, investment and funding on the agenda. The issue of fire-based EMS has been in the public eye of late, with calls in some quarters to remove DFB’s ambulance call and dispatch function and to instead merge it with the National Ambulance Service (NAS). Alongside the importance of a collaborative approach to community fire safety, Minister for State Damien English touched on the topic of fire-based EMS services during his speech, noting the possibility of retained fire services assisting the National Ambulance Service in meeting the Pre-Hospital Emergency Care Council (PHECC) response targets, particularly in rural areas. 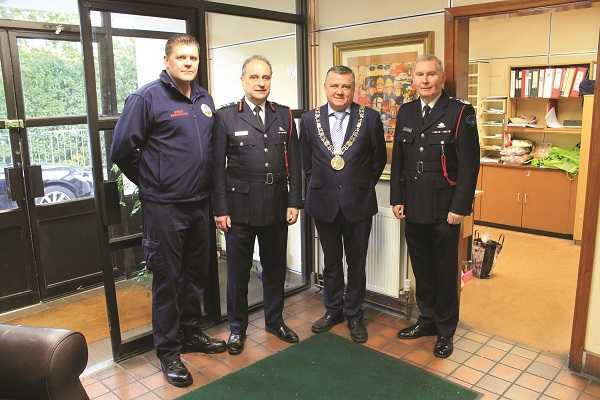 Boutinaud, Commander of the Paris Fire Brigade and Dublin City Council Lord Mayor Brendan Carr. The main theme of the conference was ‘Expect the unexpected’, with a conference programme reflecting this particular topic. One of the most interesting and well-received talks was given by Brigadier General Philippe Boutinaud, Commander of the Paris Fire Brigade, the largest fire service in Europe. Brigadier General Boutinaud was in command on the night of Friday November 13th 2015, when a series of coordinated terrorist attacks killed 130 people and injured a further 368, the deadliest incident in France since World War II. Later claimed by the Islamic State of Iraq and the Levant (ISIL), the attacks began when three suicide bombers detonated outside the Stade de France during an international friendly between France and Germany, followed shortly after by shootings and bombings at several cafés and restaurants, and then a mass shooting at the Bataclan Theatre during an Eagles of Death Metal concert. Having taken hostages within the theatre, none of the attackers survived following a police raid on the building. Following another successful St. Patrick’s Day parade on March 17th, Third Officer and Pipe Band member John Keogh looks back on a memorable day. March 17th is an important day in Ireland’s calendar, a day that celebrates the best of what we have to offer to the world. Among those who have become a staple of the annual St. Patrick’s Day parade through Dublin city’s streets is Dublin Fire Brigade, which provides a cohort of uniformed firefighters each year, wowing the crowd with their synchronised marching skills perfected on the drill ground, as well as spotless uniforms and polished medals, and accompanied by the uplifting tunes of the DFB Pipe Band. “It’s a very important day for the fire brigade, it always has been. 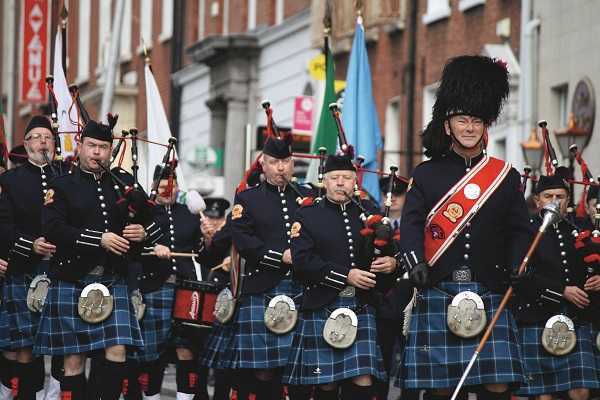 I’m a member of the DFB Pipe Band as well, and since the foundation of the band in 1985 it was always the view that St. Patrick’s Day would be our biggest event every year,” says Third Officer John Keogh, among those who took to the streets in March. 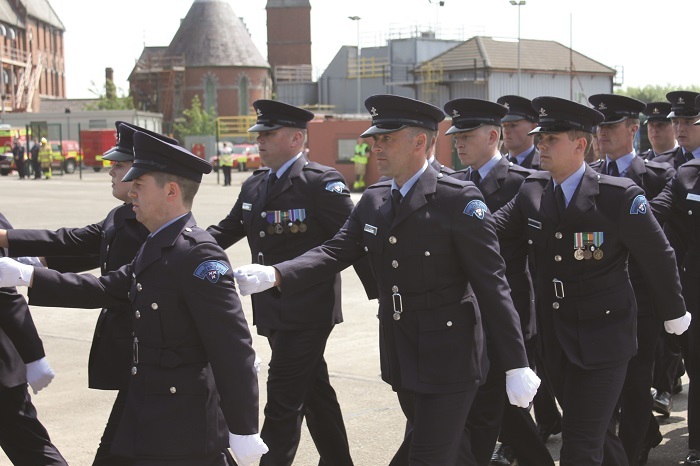 Alongside a colour party, marchers, and several international firefighters who joined their colleagues in Dublin for the day, the 2017 parade also featured the very first party of recruits from the O’Brien Training Institute, plucked from their training to showcase their newly learned marching skills on a national stage. 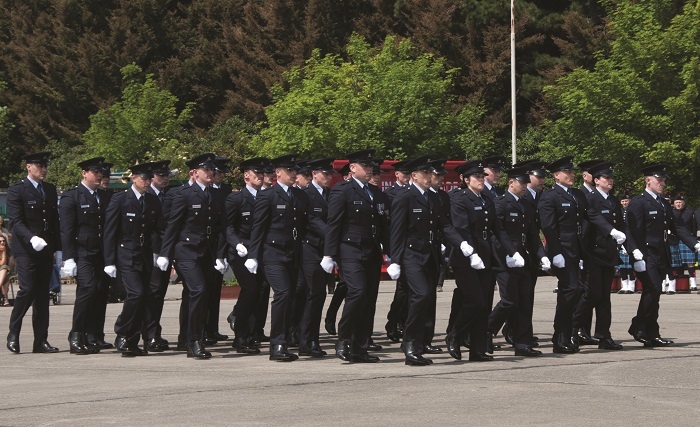 “We got them in uniform, and Brigade Training Officer Gerry Stanley marched in front of them with the flag of the DFB training centre, with the recruit instructors leading them off. 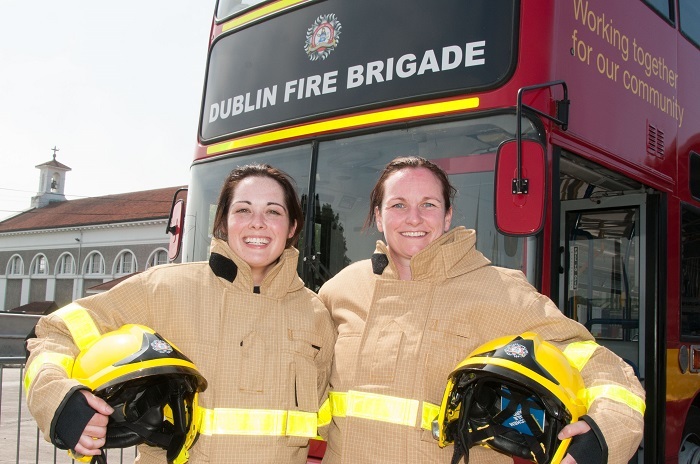 That was a great event for them, and it got them more involved with life in Dublin Fire Brigade,” says Third Officer Keogh. 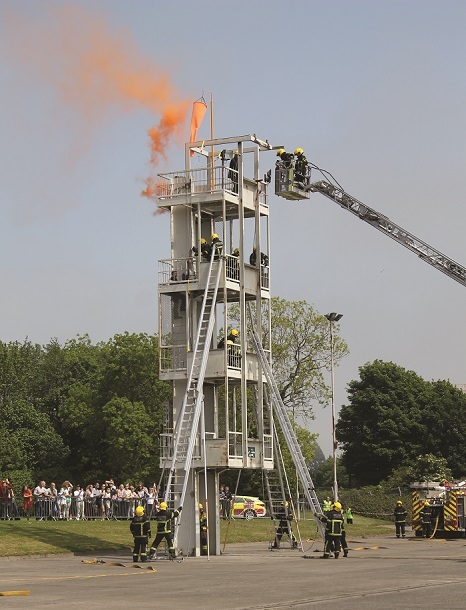 “Unfortunately they couldn’t participate in the fun afterwards – mixing recruits with trained firefighters at that stage of their training isn’t a good idea. However, the DFB Sports and Social Club arranged a venue for them and they had their own celebrations afterwards. We’ve encouraged them to take part in the parade next year and in parades going forward.” DFB staff and guests from around the world joined the Pipe Band in Diceys on Harcourt Street. The Band wound up providing entertainment to everyone who arrived at the venue, which was recorded and quickly went viral around the globe. “It was a real party atmosphere that was great to be involved in,” Third Officer Keogh says with a smile. For the past 15 years or so, the annual parade has begun at Parnell Square, marching down along O’Connell Street towards St. Stephen’s Green. 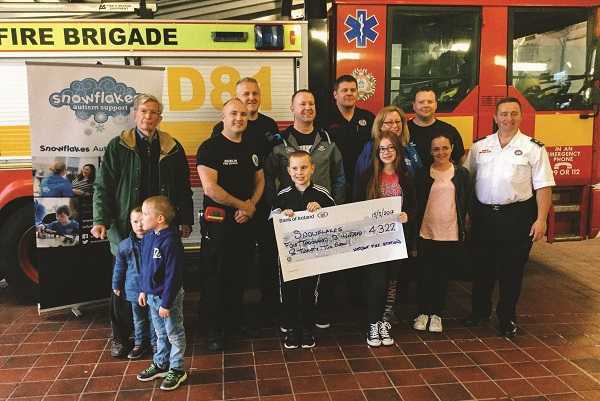 As the closest station to the start point is Phibsborough, it quickly became a meeting point for those taking part from DFB, with support on the day provided by the station’s crew, particularly those on C watch. 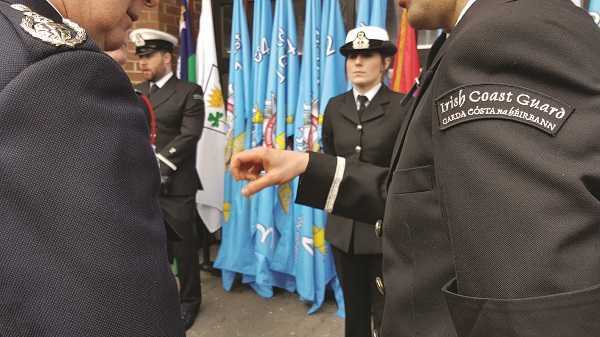 A more formalised structure to the hours before the parade kicks off has also emerged, with an event held that morning in memory of deceased members of the brigade. Beginning with a reading of the names of those who have passed away, a piper from the band plays a lament, followed by a minute’s silence and a flag raising ceremony where the national flag is raised and lowered to half mast. 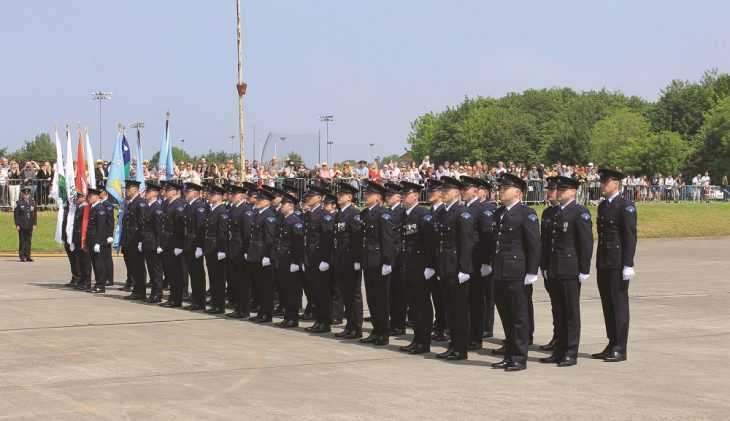 Each year the names are read aloud by the grand marshal selected to lead the DFB contingent along the parade route, usually a person of note within the brigade who has recently retired. 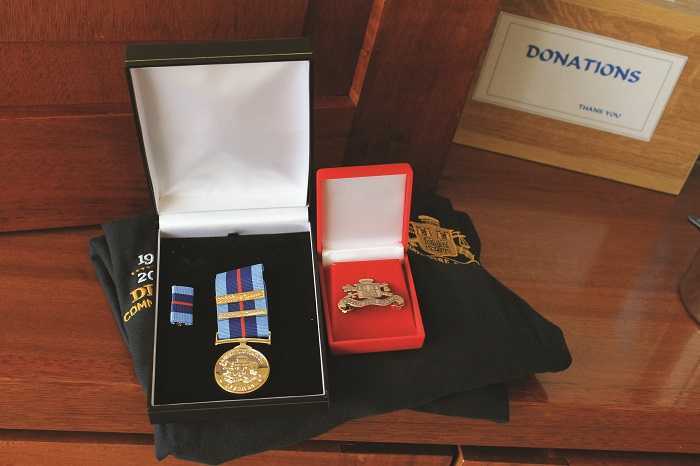 For 2017 DFB historian Las Fallon was chosen, with an additional tribute paid to the crew of Rescue 116 – though three former members of DFB who now work with the Coast Guard were unable to attend as they were working at the site of the rescue efforts, representatives from the station in Howth were in attendance. “We recognise that they’ve gone through a hard time in the past year. 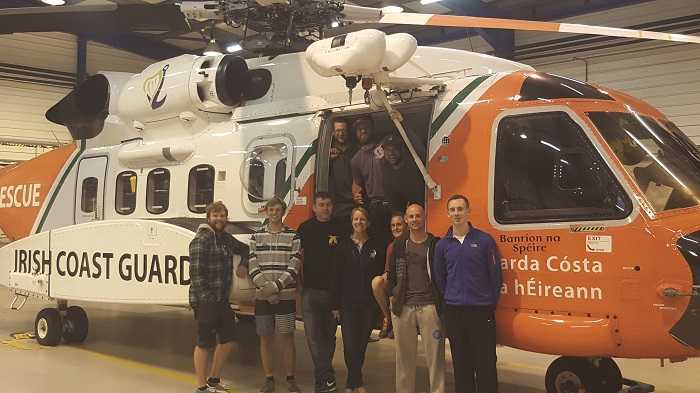 We have a great association with them, whether it’s the crews on the helicopters or the shore crews, in Howth or any of the other stations around Dublin,” Third Officer Keogh says. Going forward the plan is to grow DFB’s involvement in events like St. Patrick’s Day, taking inspiration from the State parade in 2016 that commemorated the centenary of the Easter Rising, and which saw 150 DFB personnel take part; and the annual FESSEF parade that marches through the city with representation from all full-time and voluntary emergency services. Last year the Sports and Social Club funded the purchase of flags for each station across the city, bearing their name and date of foundation, and Third Officer Keogh envisions future parades in which DFB marchers carry anywhere between 14 and 20 flags, providing a more spectacular and colourful vista along the parade route. 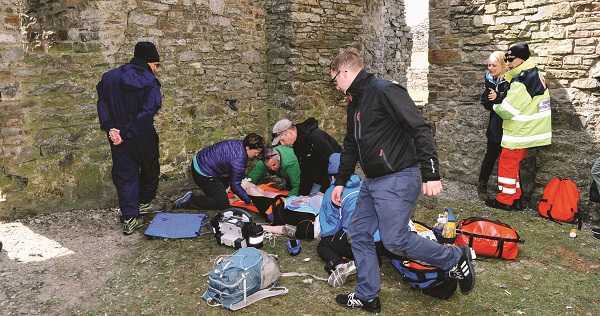 The fourth annual Emergency Gathering took place in Kinsale in May. Conor Forrest spoke with organiser Kieran Henry to discover more about this engaging and diverse two-day event. In early May, a large group of emergency services personnel from Ireland and around the world gathered in the picturesque town of Kinsale. They were there as part of the annual EMS Gathering, a two-day event organised by a team of people including National Ambulance Service advanced paramedic Kieran Henry. It was initially inspired by The Gathering 2013, a government umbrella tourism initiative that encouraged Ireland’s diaspora to return to their homeland that year. Thus the EMS Gathering was born, organised and run on a voluntary basis with something for everyone working in the field of pre-hospital emergency care, regardless of qualification or experience. 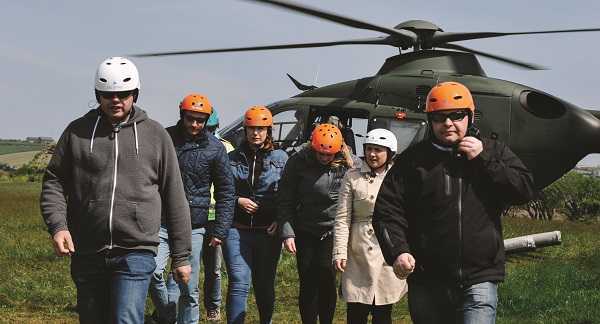 The informal nature inspired by those mountain hikes has remained – though the event includes classroom lectures given by experts in their fields, ‘Learning with Leisure’ remains a key facet of the EMS Gathering. 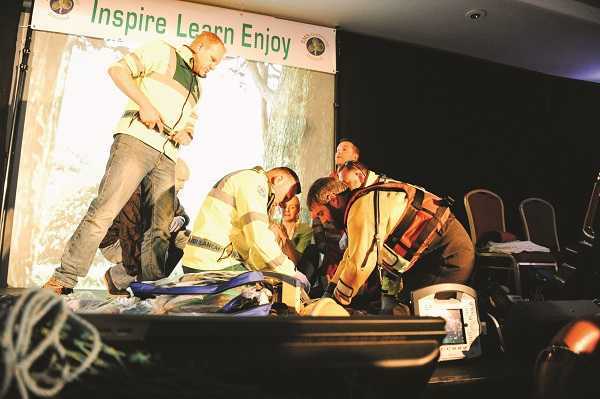 Over the years attendees have travelled to nearby farms to learn about responding to a farm-related emergency, attended talks on drowning at Torc Waterfall outside Killarney, and taken a bus tour while learning the intricacies of dealing with sepsis. Loading an injured person into a helicopter was one element of the TEMS workshop. Photos courtesy EMS Gathering. Collaboration is another factor that drives the EMS Gathering – without so many people from different backgrounds, each with their own individual learnings and experiences, the event would not be as broad in its scope. This year the Gathering moved from Killarney to the maritime town of Kinsale, with a programme covering subjects ranging from insights into mental health emergencies and dealing with drowning incidents to workshops on crew resource management and personal resilience. The Flotilla of Learning included a workshop on silver trauma and sepsis given on the Spirit of Kinsale vessel in the harbour, while attendees learned about behaviours of concern while on a walking tour of the Charlesfort. The Irish Naval Service also gave a highly insightful talk on Operation Pontus, which saw more than 15,000 migrants rescued in the Mediterranean over the course of six three-month rotations by Navy vessels. Simulations are an important feature of the EMS Gathering. “We had many agencies, both statutory and voluntary, involved. Within those agencies you have a complete multidisciplinary set of people from clinical to non-clinical,” says Kieran. “People from all different backgrounds be it the emergency medical services, military, fire service and rescue, hospitals, general practice, researchers. We had a range of national and international attendees, and they brought their own experiences.” With the dust having settled on the fourth EMS Gathering held since its foundation, Kieran is delighted with how the diverse programme for 2017 unfolded. There’s no doubt that the combination of social activities, with talks and workshops held both in the classroom and out in the locality, made for a memorable two days. Nutgrove’s annual open day was a huge success, raising vital funds for children with autism and their families. Back once more for the third year in a row, Nutgrove fire station’s annual open day proved a big success.Showcasing Dublin Fire Brigade and a number of other emergency response organisations, providing entertainment for kids of all ages, and displaying several vintage (and a few modern) emergency services vehicles, proceedings from the day were in aid of Snowflake, a children’s charity that provides support for kids with autism, as well as their parents and siblings, organising social events, support meetings, workshops and other supports. Turnout on the day was huge, with the station yard and engine bay thronged from early on. 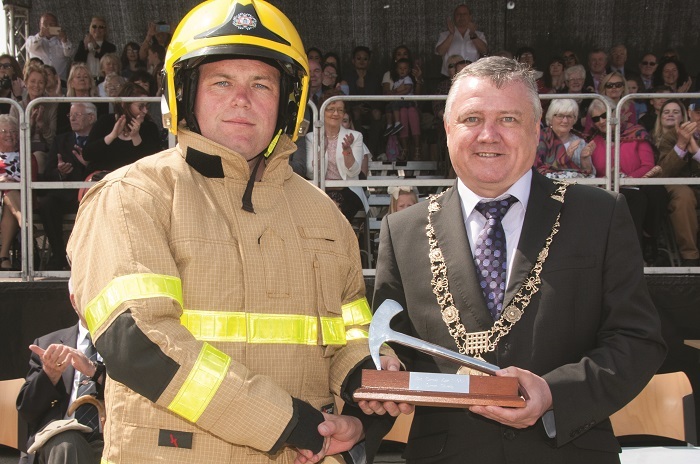 Attended by An Cathaoirleach Cormac Devlin from Dún Laoghaire-Rathdown County Council, Dublin City Council Lord Mayor Brendan Car and Chief Fire Officer Pat Fleming, the open day also played host to a number of emergency services organisations. Derek Riordan, CFO Pat Fleming, Lord Mayor Brendan Carr and ACFO Dennis Keeley. Also there was Blood Bikes East (BBE), which has been in operation since 2012, using a fleet of five bikes and a car donated by Annseley Williams and Skoda Ireland for the year to transport blood and other emergency items out of hours. “We’re full on, full service emergency service out of hours transport. From 7pm Monday to Friday we’ll go from the lock up and around, we’ll get calls from the different hospitals around the city. We’ll use the Pan European bike to go to the country, link ups with other blood bike groups. And then on the weekend it’s 24 hours a day for Saturday, Sunday and Bank Holiday Mondays,” says Denver Breslin, BBE committee member. A cheque for €4,312 was presented to Snowflake in early May. Derek is quick to point out that Nutgrove’s open day is by no means a one-man show. 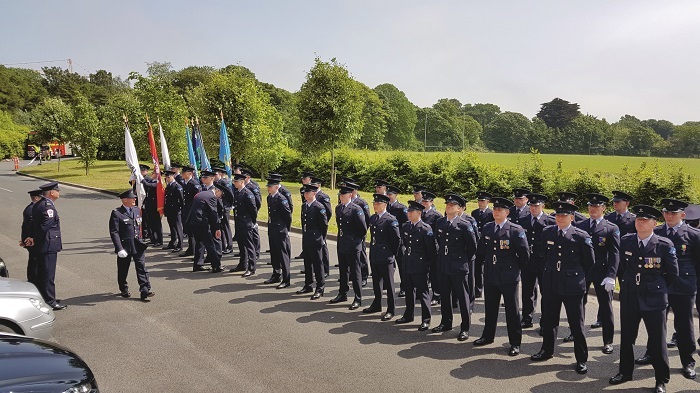 Support in organising the day came from all quarters – the crew of C watch, Dublin Fire Brigade administration, colleagues in the voluntary emergency response groups as well as the local and wider community. An Garda Síochána assisted with the traffic plan to ensure a steady flow on the day; shops like Tesco, Lidl, Aldi, SuperValu in Templeogue and Churchtown and even Dunnes Stores in Citywest pitched in with teas and coffees; DFB itself provided funding for the DJ and face painters. Local woman Alison Behan again lent her culinary skills, providing around 250 muffins for hungry attendees, again refusing to take any compensation for her time and expenses. Tony Heffernan speaks to Tiernan Cannon about one of the Saoirse Foundation’s main projects, the BUMBLEance children’s ambulance service. It is difficult to imagine a pain more harrowing than a parent accompanying their critically-ill child on what they know to be their last journey home. It is a pain that Tony and Mary Heffernan know only too well; both their children were diagnosed with the extremely rare and fatal neurodegenerative disorder, Batten disease. Their daughter Saoirse passed away in 2011, their son Liam in 2014. Both children were aged five at the times of their deaths. In the wake of these terrible tragedies, the Heffernans set up the Saoirse Foundation. The foundation’s first project, Bees for Battens, provides parents, families, and all those affected by Batten disease in Ireland with a support network and a credible source of information regarding the disease. The foundation’s second project was the BUMBLEance. Launched in 2013, BUMBLEance offers professional medical transportation services for long-term sick and seriously disabled children that require ambulance transportation to and from their homes and their principal centres of care. It also offers another very important service, which it refers to as ‘angel trips’. An angel trip is when parents travel in the back of the BUMBLEance with their child as they undertake their final journey on earth. Angel trips provide a compassionate and caring journey that allows families to concentrate entirely on the short time they have left together. The first ever angel trip transported the Heffernans’ son Liam on his final journey home, so it’s an experience that the founders are familiar with. The BUMBLEance service is based on a core principle of positivity, removing the inherent stresses associated with an ambulance trip for both the child and their family, and to make the trip as fun as possible for the child. “Our aim is to distract, comfort and entertain Ireland’s youngest patients as they travel to and from treatment centres nationwide, and to ensure the smoothest and safest journey possible, for both carer and patient, from home to destination,” says Tony Heffernan, CEO of the Saoirse Foundation. 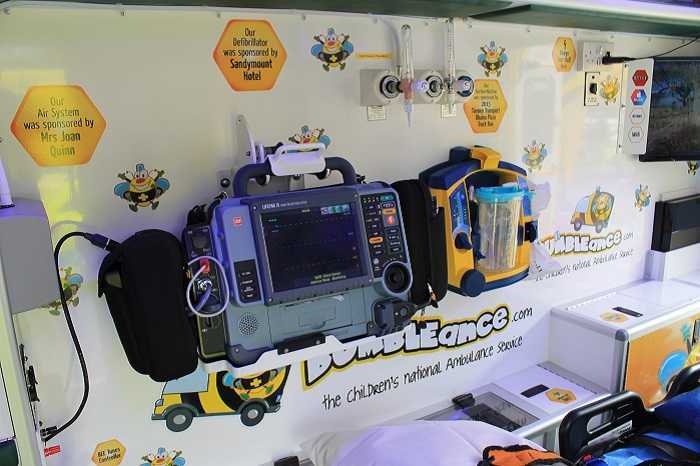 The BUMBLEance’s unique interior is kitted out with a DVD player, iPad, games console and a fridge for food, drinks and medicine. The vehicle has onboard Wi-Fi and games consoles, as well as sensory lighting and music to soothe and pacify its young patrons, and reading and colouring books. Currently, there are three BUMBLEance vehicles on the road. BUMBLEance 1 is used for interhospital transfers, with BUMBLEance 2 being used for seriously and critically ill children who need transportation to and from hospitals and care centres. BUMBLEance 3 is used as a back-up vehicle for trips, and as a PR vehicle. 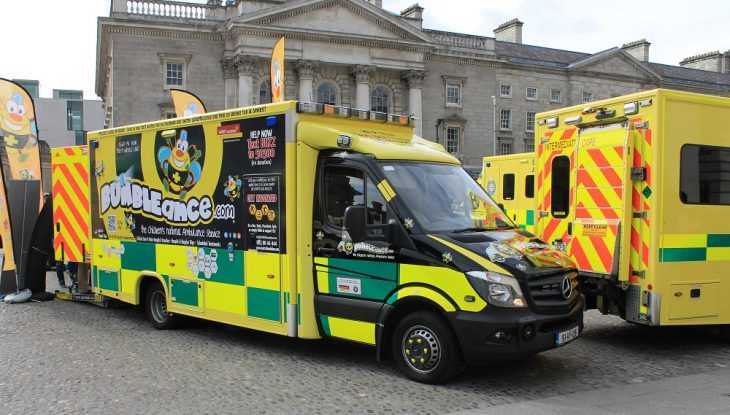 The PR element to BUMBLEance 3 has proven to be immensely successful, with the vehicle generating income and awareness at festivals, events and corporate showcases nationwide. Since its launch in September 2013, BUMBLEance 1 has transported 622 children, travelling over 200,000 km to every county in Ireland. It has facilitated 64 angel trips in that time. The people behind the project, however, hope to expand their services even further. “Our plans for future expansion include the roll out of a backup BUMBLEance 4 service, which will be Dublin-based and operated by Dublin Fire Brigade staff on a voluntary basis,” Heffernan explains. Further expansion includes a brand new regional BUMBLEette service – what is essentially a smaller version of the BUMBLEance. “The BUMBLEette service [facilitates] young patients who do not require full ambulance support with a paramedic on board, but who nonetheless are seriously ill and will require transportation to and from paediatric hospitals, respite care centres and hospices throughout Ireland,” Heffernan adds. The BUMBLEette service is due to be rolled out nationwide over the coming years, with the first service – which will serve the North West region – having launched in the first quarter of 2017. By the close of 2018, the regional BUMBLEette services are estimated to make over 2,000 trips per year across the whole country. “Our fleet will grow to nine vehicles in the next two years, and each vehicle will then be available for operating 250-plus days each year, helping children across rural and urban areas, getting them to where they need to be in safe, reliable and modern vehicles,” says Heffernan. The BUMBLEette vehicles themselves will enable the transportation of a driver and two children in wheelchairs with one caregiver or parent each, or a driver plus a fully operational stretcher and four seated passengers. 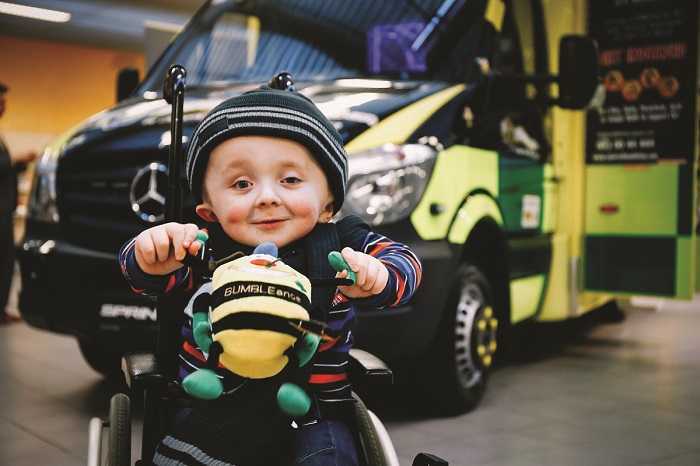 They will be kitted out with the same child-friendly toys and gizmos that make the existing BUMBLEance vehicles what they are, ensuring that their young clients are as comfortable and happy as possible. The BUMBLEance project was created by parents who understand the struggle of caring for a sick child, and Tony Heffernan and his team work tirelessly to ensure the smoothest and most enjoyable journey for everyone on board – parents and children alike. “We understand how stressful it is to transport a sick child, which is why we will be with you every step of the way,” he says.